This is my first ever attempt at sewing pants, and except for a minor glitch when I sewed the two legs together, it was really easy (even for a beginner sewer like me!). I used the lovely tutorial and free pattern from Made, which I found through Becced, and the fabulous fishy fabric which I'd bought a remnant of the other day. 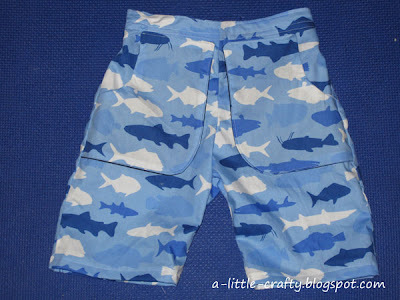 The length of the shorts was dictated by the size of the fabric, which lucky for me was exactly the right length. Mr 5 was suitably pleased.